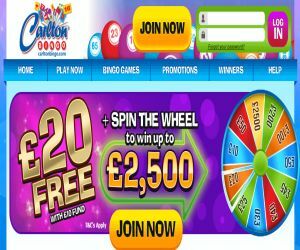 Carlton Bingo | Spin the Wheel Bonus to win up to £2,500! 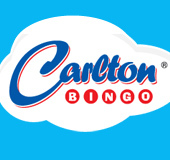 Roll up to Carlton Bingo, an action-packed UK online bingo site for 2016! As one of the most famous UK branded bingo halls, Carlton Bingo has already attracted large online fan base. The luxurious blue-themed site was produced by Jumpman Gaming, on the 15 Network, and was recently given a sleek revamp. Since Carlton is experienced in the world of bingo, the exciting site is designed to ‘make players happy'. So when you enter the online bingo action, you can you can curl up with a cup of tea in your pajamas and expect the best bonuses and perks. Carlton is also full to the brim with the best bingo, slots, and jackpot hits around! When you enter Carlton's world of fun and deposit your first tenner, you can pick up a fabulous £20 free play. That's not all, as you can also take a Free plus spin on the Wheel of Fortune to win up to £2,500. Carlton is also loaded with exciting promotions and treats like Newbie Free Bingo, Spin & Shop, Weekend Offers and Monday Madness. You can also strike it lucky with jackpot games, and join the VIP club for more exclusive rewards! Check here for the latest exclusive coupon codes. Carlton Bingo boasts an exciting range of themed 90 Ball and 75 Ball Bingo games, which run around the clock. The fun doesn't stop there, as they also have a huge selection of side games like Fluffy Favourites and Sugar Train. You can also play the Instant, slot machines scratch cards games whilst playing bingo at the exact same time. You can also stack your chips in the casino lounge to play Roulette, Blackjack and Live games. They also have a fabulous chat community where you can meet new people and also play chat games with the chat moderators whilst you are waiting for or even playing some bingo. You can also continue the fun on your mobile, smartphone, iphone, ipad and tablet!